LITTLE ROCK, Ark. 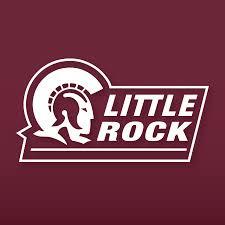 (AP) — Zac Cuthbertson made 1 of 3 free throws with less than two seconds remaining to stop a 12-0 run by Little Rock and Coastal Carolina held off the Trojans 72-71 on Thursday night. Devante Jones finished with 21 points for the Chanticleers (9-9, 3-3 Sun Belt Conference) and his two free throws gave them a 71-59 lead with 4:17 left in the game. But Deondre Burns had a 3-point play and Rayjon Tucker followed with a 3-pointer to pull the Trojans (7-13, 2-5) even at 71 with 54 seconds remaining. Little Rock turned the ball over with seven seconds left and Kamani Johnson fouled Cuthbertson on a 3-point try. He made the first, missed the next two, but Kris Bankston’s 3-point try was off the mark at the buzzer. Ajay Sanders sank five 3-pointers and scored 19 for Coastal Carolina, while Cuthbertson scored eight and grabbed 10 rebounds to help the Chanticleers post a 38-31 advantage on the boards. Coastal Carolina was playing on the road for the first time since Jan. 5. Tucker finished with 29 points for Little Rock, hitting 14 of his 15 foul shots. Burns added 11 points. The Trojans are 0-5 all-time against the Chanticleers.